Harry and James, James and Harry. Our dear Men with Pens. Both are really amazing guys that I’m proud to call my friends, and both are sushi lovers one is a sushi lover. I’m still working on the other one. Harry was the easy one. He loves sushi, especially salmon. Salmon, salmon, salmon… he apparently can’t get enough of it. (I’m pretty sure he’s actually a cat, though I’ve never actually met him offline, so I can’t say for sure.) It was ever so simple to figure out a sushi he would love, and whaddaya know? I made it, and it was pretty gosh darn delicious. And then… there’s James. The difficult one. Turns his nose up at sashimi, won’t go within 100 yards of a fish egg, and generally refuses to try sushi. So troublesome, that one, when all I wanted to do was make sushi for him! But, as we all know, I certainly do love a challenge, and of course in the realm of sushi… I always prevail. Don’t forget to enter my contest to win a copy of the book, Sustainable Sushi, by Casson Trenor. You have until Saturday night to enter! Slice the tomato, discard the seeds. Lay some smoked salmon in the middle of the wrapper, leaving about 2 inches uncovered on either end. Lay some tomatoand olives on top of the sumeshi. Top with the basil pesto. I just want to note that I’m not *fussy*, but rather selective. And discriminating. With good taste, of course. 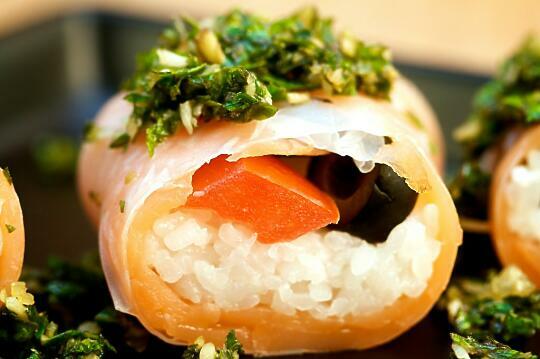 Which this roll seems to have – olives, salmon and pesto? I could eat that. Mmhm. James Chartrand – Men with Pens’s last blog post… Sticky Business Contest Winners: Congrats! Sure I’ll provide chef services for you… come to Southern California and I’d be glad to make you your sushi! 😀 But seeing as that’s not likely to happen anytime soon (I though Friar was supposed to roadtrip kidnap you! I should bribe him with sushi…) perhaps someday I’ll make it out to your side of Canada and I can make your sushi for you. Yum… this looks good… I WANT to like sushi, but there is something in the texture… although smoked salmon or shrimp ones….yummy. I am strangely craving fish this week after serious flu bug… hm?…Have no idea what that’s about. Maybe this would be a good starter sushi recipe to make. Any other tuna or salmon ones you would suggest? This looks wonderful as I am a big pesto fan and there are endless possibilities for pesto that you could change up the inner veggies with – cilantro pesto with diced chorizo, red peppers ands thinly sliced jalepenos could be for someone with mexican taste…oh thanks for getting my thoughts going! I guess sushi can be filled with anything according to personal tastes! Thanks again! Janice – I recommend a classic Philadelphia Roll. Buy the box (not a tub) Philadelphia cream cheese and some fresh (as you can get it) salmon. Prepare nori and rice as normal and lay strips of the salmon with strips (easier to cut off the block, hence the box) of cream cheese. Yum! 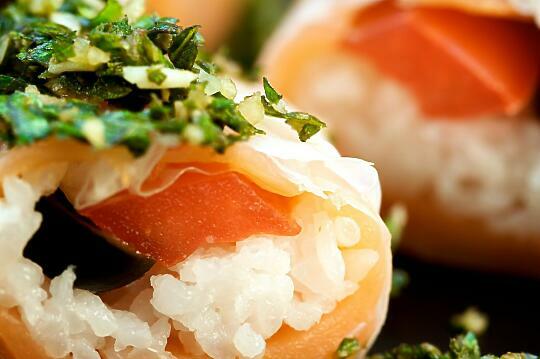 Janice – Like Michael said, the Philadelphia Roll is a great one using smoked salmon. If you’re comfortable with sashimi (raw fish) then you can also try that with sashimi-grade salmon. Another good beginner roll using sashimi is sashimi-grade tuna and avocado. Very basic, but very delicious. The Crunchy Shrimp Roll is a popular one with my family, and it doesn’t use any fish – just tempura shrimp (which you can buy frozen at most grocery stores), avocado and green onion. 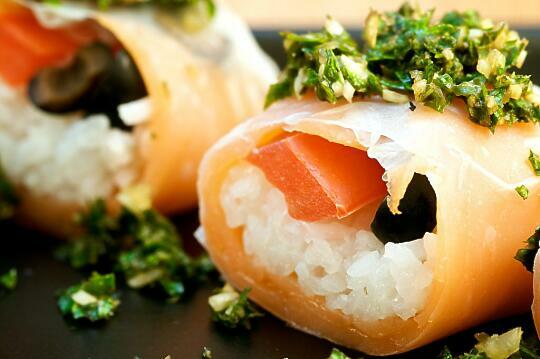 If you’d rather use canned tuna rather than raw tuna, try my Tuna Salad Sushi. It might seem simplistic, but tuna salad and lettuce actually go very well with the sushi rice. Katie – Oh yes, there are so many different possibilities for sushi fillings, and you can come up with tons based on your own personal preferences. That one actually sounds pretty good… I may have to try making it sometime soon! Michael – Thanks for the suggestion for Janice! I agree… we should get James to try this one and guest post about it! That’s actually not a bad idea. I recently replaced my broken camera with a nice one that does work, and I’ve been trying to think of photos that might be interesting to people. Hm hm!! At first, when I read that the ingredients called for spring roll wrappers, I was thinking those flour wrappers for egg rolls. But I think you actually mean the rice paper wrappers that you see used in Vietnamese summer rolls? James – Fantastic! You can be my first ever guest poster. 😀 And you’ll finally try sushi! sorry to ask, but I don’t understand exactly: In your receipes is the amount of sumeshi raw oder cooked? For example: 2 cup sumeshi – is this 2 cup raw oder cooked sushi rice. Thanks and keep on with your wondeful website!